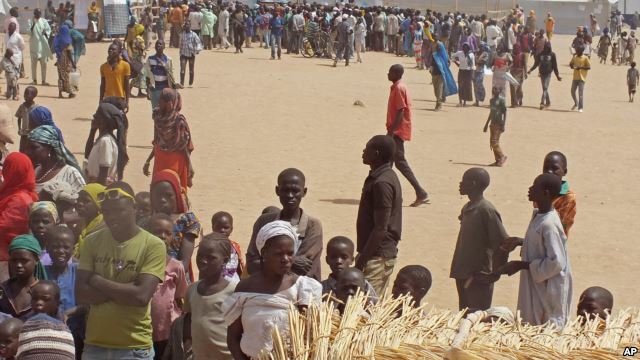 The World Food Program (WFP) says it is scaling up aid for hundreds of thousands of hungry people, many severely malnourished, who have fled to Chad, Niger and Cameroon to escape attacks by Boko Haram militants in northeastern Nigeria. 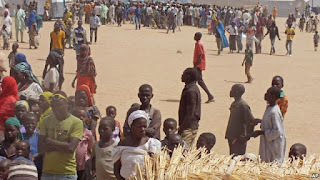 According to the WFP, nearly three quarters of a million people in countries bordering Nigeria are facing a worsening food crisis linked to increased violence by Boko Haram militants. WFP spokeswoman Bettina Luescher told VOA that recent attacks have led to a sudden surge of internally displaced people and refugees. “We are quite concerned about people [who] are really afraid of Boko Haram. They are telling harrowing stories about fleeing from the violence, being on the run, sometimes traveling for several days and we have to make sure that especially the children and moms are being taken care of,” Luescher said. The WFP says it plans to increase food aid to more than 650,000 vulnerable people in Chad, Niger and Cameroon. The agency warns the security crisis playing out in the region could lead to prolonged hunger. Impacts from this emergency already are visible. The WFP reports a dramatic rise in malnutrition among children under five and women in the areas affected by Boko Haram violence. It says acute malnutrition rates in some areas of Chad have passed the World Health Organization’s emergency threshold of 22.5 percent. In addition, WFP spokeswoman Luescher said peoples’ livelihoods in the countries of refuge are being severely disrupted. “Closed borders have disrupted trade. They have halted access to farmland, prevented herders from reaching grazing land. Fishing, which is a really important part for living for many people in Chad, is banned for security reasons. In Chad, rural households in affected areas sold more livestock than in a normal year, meaning they are trying to get some money in order to buy food,” she said. Luescher added that people are resorting to extreme measures to survive. She said one in three households reportedly are falling into debt and selling whatever they have to obtain food. She said the WFP is appealing for $16.3 million to respond to the emergency. Silver-haired and always smiling, Bennie Botes has cut generations of men’s hair in his shop in the working-class Johannesburg suburb of Newlands. A client chats with Botes as others wait their turn for a haircut. Among them are a burly, bearded mechanic wearing oil-stained boots and the suited multimillionaire owner of a shopping mall. What attracts such a diverse clientele is an amazing collection of rugby paraphernalia. On the walls and ceiling are thousands of autographed rugby jerseys, caps, pens, scarves, balls, glasses and flags, all hunted down by Botes or donated to him by rugby fans across the world. The barber said his “obsession” with all things rugby started with a friend’s joke, almost 50 years ago. “He said, ‘Why doesn’t you start making it not only a plain barbershop?’ And from that day it’s just growing, and growing, and growing,” said Botes. Botes’ rugby gear overflows into the back of his shop and his nearby house. Over the years Botes has cut many Springbok legends’ hair. They too, were happy to donate valuable memorabilia. “Like Oom Piet Malan; he died now, a month ago. I was honored to know him very well. And Fanie King – beautiful rugby players, good rugby players. Then my oldest Transvaal player – Oom Tienie Mathyssen,” recalled Botes. One of his favorite items is a 19th century rugby ball from England – a massive leather, laced oval about three times the size of a modern ball. 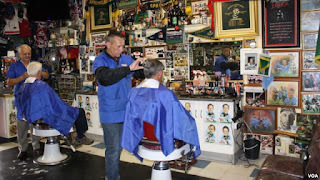 Botes said his business only looks like a barbershop - it’s actually South Africa’s only “true” rugby museum. “My book collection is from 1818, from the start of rugby… That’s the oldest [item], that book. And then I’ve got a photo there from 1912 – 1913, of the Springboks,” he said, pointing out the items. Then he gestured towards a green bottle covered in dust. Its label is falling apart, but on it is the famous symbol of South African rugby, a jumping Springbok antelope. “I’ve got a bottle of wine. He’s more than 100 years [old],” said Botes. Botes’ colleague, Louis de Hart, said many rugby fans – men, women and children – visit Bennie’s not for a haircut, but just to talk rugby and to stare in wonder at the memorabilia. “They all like have a debate about the teams. Sometimes they gooi (throw) a bit of arguing. Not like physical, but that happens a lot here,” said de Hart. On a recent Saturday afternoon, some of Botes’ diehard patrons watched a local rugby game on TV inside the barbershop. At times like these they often share their fondest rugby memories. Peter Wilson recalled his first schoolboy rugby game in the 1940s. “I was so stupid! I was a front-ranker. I took the ball, and when the chap came rushing to me, I threw the ball over his head and ran around him to catch it again! I didn’t even know about the forward pass [rule]. I made a proper idiot of myself,” he said. At Bennie’s there’s cautious optimism about the Springbok’s chances of capturing an unprecedented third rugby world cup title. “What I always say is: It’s not the size of the dog in the fight, it’s the size of the fight in the dog,” said Wilson. Outside his shop, Botes fires up the barbecue on the pavement and the party starts. Naturally, a CD of some of South Africa’s most loved rugby tunes plays in the background. Back inside, Botes gazes at a faded photo. It’s Loftus Versfeld Stadium, Pretoria, 1968. And Springbok scrumhalf Dawie de Villiers has just scored a try to destroy the British Lions. Ugandan police fired tear gas for a second consecutive day on Thursday to disperse supporters of presidential contender Amama Mbabazi, who is seeking to unseat veteran leader Yoweri Museveni in next year's elections. Former prime minister Mbabazi, 66, has emerged as a strong challenger to his one-time ally Museveni, who has ruled the east African nation since 1986. Mbabazi, an influential figure in the ruling National Resistance Movement (NRM) before he quit the party, has held large rallies across eastern Uganda since Monday. Mbabazi's spokeswoman, Josephine Mayanja-Nkangi, said one of Mbabazi's bodyguards was wounded in the leg when police fired tear gas and live bullets to disperse his supporters in Jinja, an industrial town 90 km (56 miles) east of the capital Kampala. "A large crowd had gathered... but police were determined to stop Mbabazi from addressing them, so they again fired tear gas and live bullets," she said, adding that a police truck had rammed Mbabazi's vehicle. Polly Namaye, the police spokeswoman, denied security forces had used live bullets. "Mbabazi has been told to stick to consultative meetings in enclosed venues but he wants to do rallies. Police have a mandate to stop any violations of electoral laws," Namaye said, adding that she had not received reports of injuries. Government officials say Mbabazi's mass rallies are illegal as he has not yet been formally nominated by the electoral commission for the polls to be held in February and March next year. 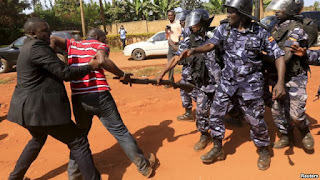 On Wednesday, police also fired tear gas in Soroti, a town in northeast Uganda, to scatter a rally of Mbabazi's supporters shortly before he was to address them. Museveni's critics have accused him of using strongarm tactics to retain power and quell growing frustrations over corruption and perceptions the 71-year-old wants to remain president for life. Mbabazi is running as an independent candidate after his bid for the NRM ticket was frustrated. Charles Rwomushana, Kampala-based political analyst and former intelligence operative, told Reuters the government had been blindsided by the size of Mbabazi's rallies. "They thwarted his bid for the NRM ticket and thought that would kill his momentum," he said. "You will see more tear gas."